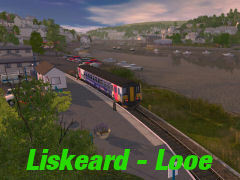 The Looe branchline in Cornwall, a length of 8.75 miles and starts at the town of Liskeard. The line decends steeply for the first 2 miles around a large loop which passes under the mainline before reaching Coombe Junction. A couple of passenger services call at the halt just up the line before reversing but most just reverse at the junction to continue the journey down towards Looe through the valley, passing the request halts of St Keyne, Causeland and Sandplace along the way the final part of the line runs along side the Looe estuary to reach the seaside fishing port of Looe. To the North of Coombe Junction is also the cement depot at Moorswater which has rail access. Passenger services are worked by Class 150 Sprinter units.